The following investigation is a guest blog from cosmetic chemist Daphne Kapetas. The answer should be nothing! What do facial scrubs and fish have in common? Again, the answer should be nothing! What about toothpaste? Does toothpaste have anything in common with the fish we eat? Idyllic beaches, fish, facial scrubs, body wash, toothpaste and maybe even some of the food we choose to eat, unfortunately, all have something in common, microplastics. More specifically plastic microbeads. But what about the plastic pollution in the deep sea floor and throughout our water column? We wake up in the morning, wash our face and body with products and then brush our teeth with more products and the majority of us happily assume that manufacturers are doing the right thing when making these products. As we wash with products containing microbeads, these tiny toxins begin their journey of destruction by flowing down our pipes and into our sewage system. Big pieces of plastic are removed by sewage treatment plants and stormwater filters, but these microbeads surreptitiously escape into our rivers, lagoons and oceans. So why the fuss over PLANKTON? Microscopic plant-like organisms, tiny sea-like creatures. Bottom and base of the marine food chain. Microbeads are accidently eaten by phytoplankton, then the bigger fish come along and eat them. You guessed it, then we come along and eat the fish that ate the phytoplankton, that ate the microbeads! To make matters worse, microplastics are like sponges that soak up toxic chemicals, like DDT or PCBs. 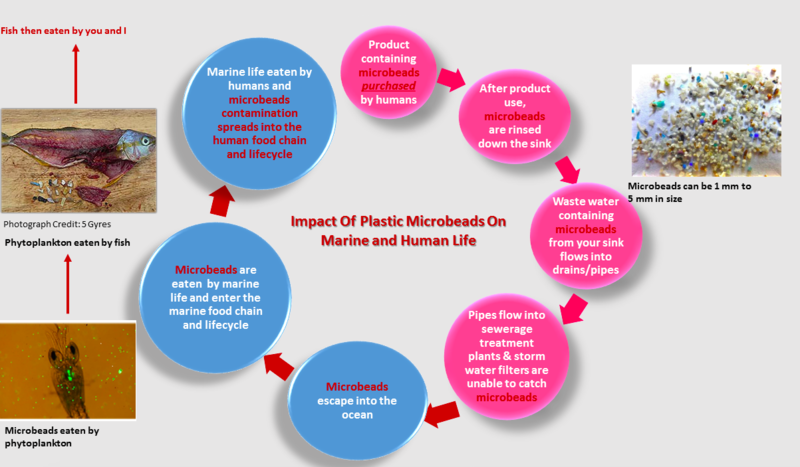 Microplastics that are then eaten by the marine life transfer contaminants into the marine food web and as animals eat each other, these contaminants move up the food chain. Interestingly, the word ecology, is derived from the Greek word οἶκος, "house"; -λογία, "study of". Would you dump rubbish in your own back yard? What can I do, I hear you say? Think about what you would like to achieve (such as no microplastics in the ocean) and make decisions based on that goal. The following is a list of ingredients that appear on the back of product packaging. These are the toxins to beware of when purchasing personal care products. 3) Check out Good Scrub Guide . Tangaroa Blue Foundation's, Australian Marine Debris Initiative has a sensational guide which assesses the use of plastic abrasives in facial exfoliators. There is both an Australian and UK Edition called the "Good Scrub Guide". 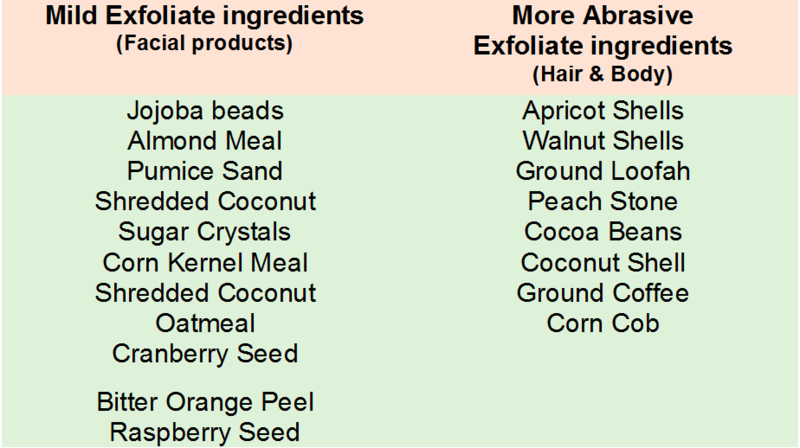 4) Look for personal care products that contain biodegradable and naturally sourced exfoliants or abrasives. Always choose products that biodegrade. 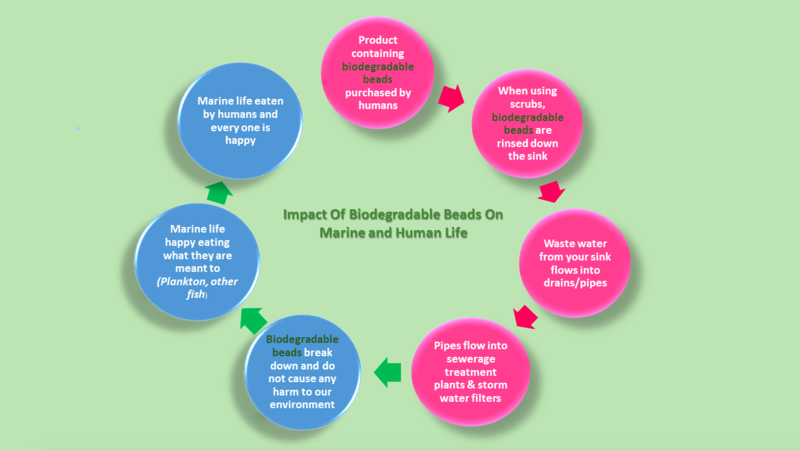 Renowned Scientist, Dr Jiann Yu a Research Professor from the Hawaii Natural Energy Institute, School of Ocean and Earth Science & Technology at the University of Hawaii at Manoa, is working tirelessly to invent true biodegradable plastic. Dr Yu is developing a bioplastic made by microbes that can degrade in cold seawater. It is also as an energy and carbon reserve. So until alternatives like this bioplastic are ready, minimise your relationship with plastic. Dr Yu advises me that a United Nations agency is calling for personal product and cosmetic makers to globally phase out plastic microbeads. It also warns against the use of beads made of "biodegradable" plastics such as polylatic acid (used as a substitute for the widely used plastics such as polyethylene) because polylatic acid only degrades at high temperatures in industrial settings. 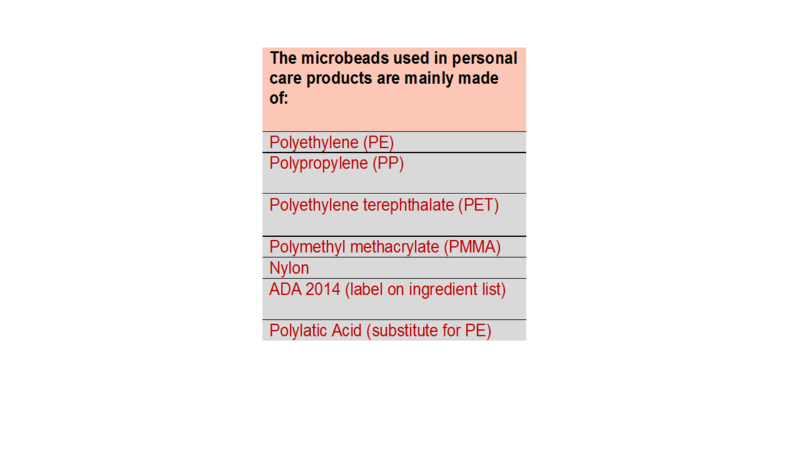 Be careful, some companies claim that their plastic microbeads are biodegradable… don't go there! Some companies have agreed to slowly phase out the use of microbeads from their products and they have until 2020 to get it right. 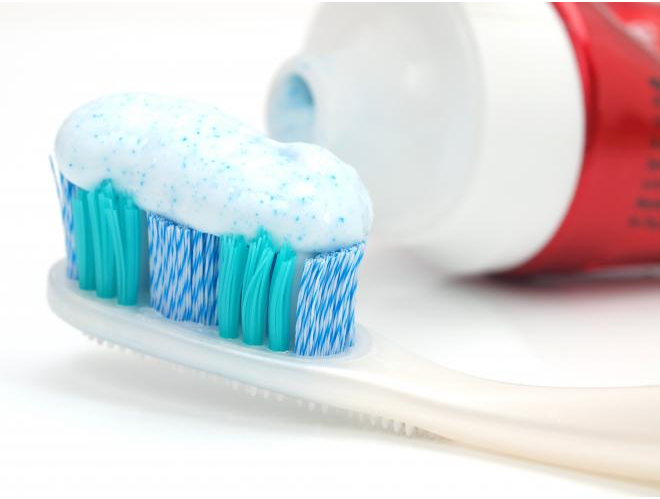 President Obama has recently signed a new law that will ban the selling of environmentally-damaging microbeads in soaps and toothpaste by July of 2017. The call to action for Australia to follow the US is slowly gaining momentum. We are always told not to take things for granted and then we nod our heads in unison; "Yes..Yes". But do we actually ever sit still long enough to imagine what life would be like without life in our seas and without life in our skies? Our understanding of the potential contamination from microplastics entering our environment, relatively speaking, is in its early days and some questions are yet unanswered (12). Our marine life, on the other hand, is obviously having a hard time from our plastic pollution, amongst the many other challenges they face. It is clear that microplastics are an emerging threat that requires our attention. I live by "The Precautionary Principle". Prove that microbeads are SAFE before you expose living creatures to them. Walk the talk, It's as easy as that! You have the power, choose well. 7. Plastic pollution in the world's oceans: More than 5 Trillion plastic pieces weighing over 250,000 tons afloat at sea. Eriksen, M., Lebreton, L. C. M., Carson, H. S., Thiel, M., Moore, C. J., Borerro, J. C., et al. 9, s.l. : PLoS ONE, 2014. e111913. 9. Lusher, A. L. et al. . Microplastics in Arctic polar waters: the first reported values of particles in surface and sub-surface samples. nature.com. [Online] 8 October 2015. [Cited: 16 October 2015.] http://www.nature.com/articles/srep14947. Sci. Rep. 5, 14947; doi: 10.1038/srep14947 (2015)..
13. 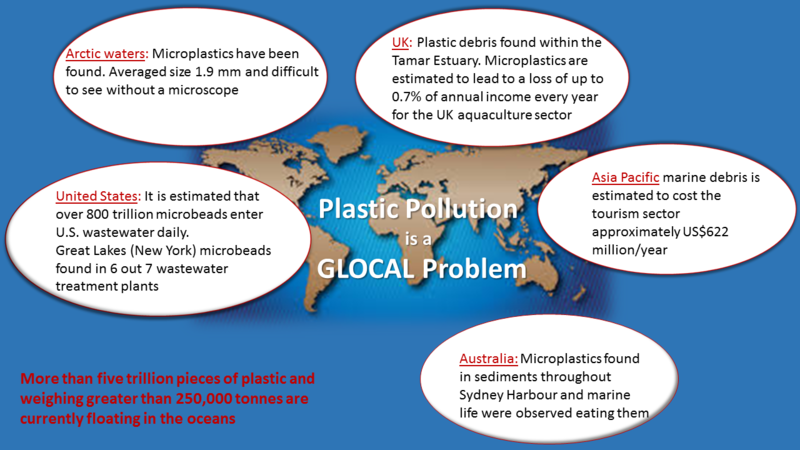 Microplastic - An Emerging Contaminant Of Potential Concern. Mark Anthony Browne,Tamara Susan Galloway. s.l. : INTEGRATED ENVIRONMENTAL ASSESSMENT AND MANAGEMENT , 2007, Vol. November. 14. Greenwall, Linda. Plastic... not always fantastic. Aesthetic Dentistry Today. August, 2015. 15. Plastic debris in the open ocean. Cózar, A., Echevarría, F., González-Gordillo, J. I., Irigoien, X., Úbeda, B., Hernández-León,S., et al. 111, s.l. : Proceedings of the National Academy of Sciences of the United States of America, 2014, Vol. 28. 10239–10244..
16. Galloway, Tamara S. Micro- and Nano-plastics. Springer Link. [Online] 2 June 2015. [Cited: 25 October 2015.] http://download.springer.com/static/pdf/610/chp%25...=1445907686~acl=%2Fstatic%2Fpdf%2F610%2Fchp%25253A10.1007%25252F978-3-31. 17. Water Column. EcologyDictionary.Org. [Online] US Environmental Protection Agency, 2008. [Cited: 29 October 2015.] http://www.ecologydictionary.org/water_column.